More or Less is a BBC 4 radio program, hosted by Undercover Economist Tim Harford, dedicated to explaining and sometimes debunking the numbers and statistics used in political debate, the news and everyday life. It's a fascinating program and we often play the podcasts as we toil behind the scenes here at Political Calculations. We bring that up because we've noticed a pattern developing in this past week, where we find ourselves treading on their territory, as we've explored a better measure of the economic well-being of the people of a nation, debunked a key assertion of a team of climate scientists and used U.S. soybean exports to explain why China's economy may not be performing as dismally as it appears. The nation has arrived at this tipping point in part because more Americans are moving up the income ladder. In 1971, just 14 percent of Americans were in the upper income tier, which Pew defined as more than double the nation’s median income. Now, 21 percent of American households are in that upper earning category -- at least $126,000 a year for a three-person household. But at the same time, many Americans are falling behind, helping to deplete the middle. In 1971, a quarter of American households fell into the bottom earning tier, which Pew defined as less than two-thirds of the nation’s median income. By 2015, 29 percent of American households fell into that category, which for a three-person household meant they earned $42,000 a year or less. Overall, the share of Americans living in middle-class households has declined from 61 percent in 1971 to 50 percent. The hollowing out of the middle class has been a source of consternation among many economists, politicians and the public at large. They say as Americans move toward the economic extremes it is harder to find common ground, and a common sense of what it means to be an American. The changing economic fortunes of American households has been most dramatic at the far ends of the income spectrum, Pew found. The share of households earning more than three times the median income--$188,000 a year for a family of three in 2014 dollars--is now 9 percent, up from just 4 percent in 1971. At the bottom, one in five households earned less than half the overall median income--$31,000 a year in 2014--up from 16 percent in 1971. So we have the ranks of both the lowest and highest income earning American households simultaneously increasing as the ranks of middle income earning Americans have become depleted. But who were the biggest winners and losers? Because of our previous work exploring the distribution of income within the United States, and particularly our work in exploring the distribution of income by age, we immediately recognized that what the Pew Research Center's analysts were seeing in the "hollowing out" of the U.S.' middle class wasn't the result of some nefarious cause, but rather the inevitable result of the changing age demographics of the U.S. population coupled with the nation's average lifetime earnings trajectory. More specifically, the differences in the size of the living population of the U.S. by generation. The chart below shows the number of Americans born, whose births were registered, in each year from 1909 through 2004, while also indicating their generational grouping. Let's focus on three of the generations indicated on this chart: the Baby Boomers (born in the years from 1946 through 1964), Generation X (born in the years from 1965 through 1981) and Generation Y, now better known as Millennials (born in the years from 1982 through 1999). What we immediately observe is that the number of Americans in Generation X is much, much smaller than the Baby Boomer generation that preceded it and is also much, much smaller than the Millennial generation that followed it. Now, let's show where those three generations fit among the distribution of income in the United States by age group. 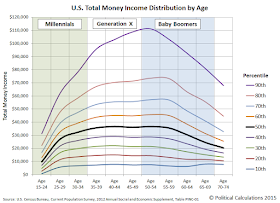 What we see is that Baby Boomers, who would be Age 51 to Age 69 in 2015, occupy the ranks of the highest income earners in the U.S., while Millennials, whose would be Age 16 to 33 in 2015, occupy the ranks of the low end of the income earning spectrum. Meanwhile, we see that the much smaller Generation X finds itself sandwiched between these two larger generations in the ranks of the middle class. Is it really any wonder then that the number of middle class households has shrunk as it has while the apparent income inequality among U.S. households has increased? The mystery of the disappearing U.S. middle class is solved - the apparent movement of Americans toward the "economic extremes" is primarily the result of the changing age demographics of the U.S. income earning population! 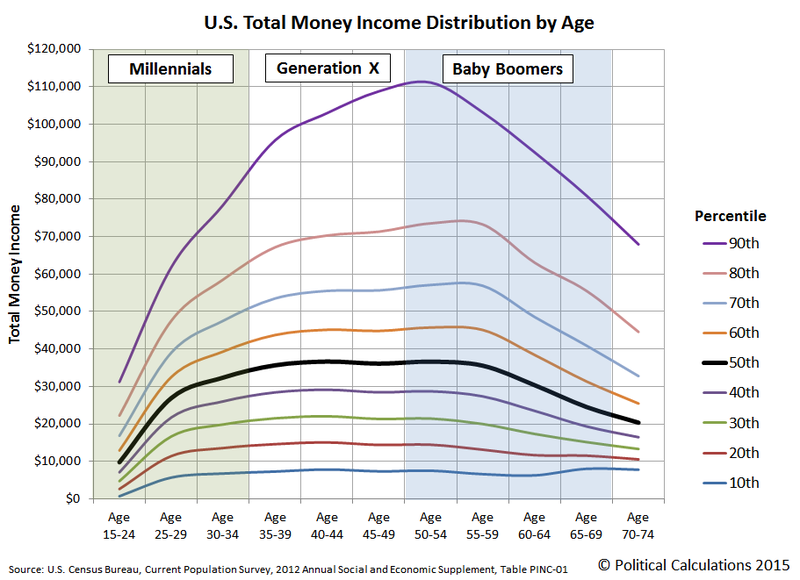 Visualizing the 2012 Distribution of Income in the U.S. by Age - originally posted 18 January 2013. Average Lifetime Earnings Trajectories by Education - originally posted 30 July 2009. Update 15 December 2015: This post has been modified to add the text "coupled with the nation's average lifetime earnings trajectory" to the end of the twelfth paragraph. Also added a link to our "Generations" post in the same paragraph.